Blogs & Blooms: Hardy Fruits Conference the Best! Hardy Fruits Conference the Best! I am just flying home from Saskatoon. Not an unusual location and certainly not exotic but - seriously- this was one great conference. I met so many farmers - new and old. I had some laughs - Becky, a small market gardener, told me she was looking for "Prince Farming"; Deanna told me she had already found him and he is both handsome and handy! 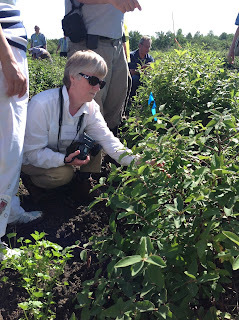 The talks about new crops were riveting (in a geeky horticulture kind of way) and the tours were wonderful. I learned about spacing of new crops and we met folks growing an entire tree nursery of 65,000 trees on 2.5 acres in town. There are just so many people to mention and thank but first comes Dr. Bob Bors, head of the fruit breeding program at the University of Saskatchewan. 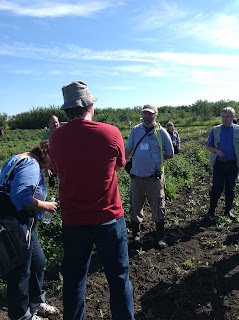 This coming friday I will speak more about the NAFEX conference on CBC radio during my regular phone in on July 27th and have also written a column about garden fruits for the Calgary Herald. Above are a couple of pictures of the state of things in the field of horticulture. More to come. Debbie from Alaska is shown here looking at the new wonder fruit Haskap. 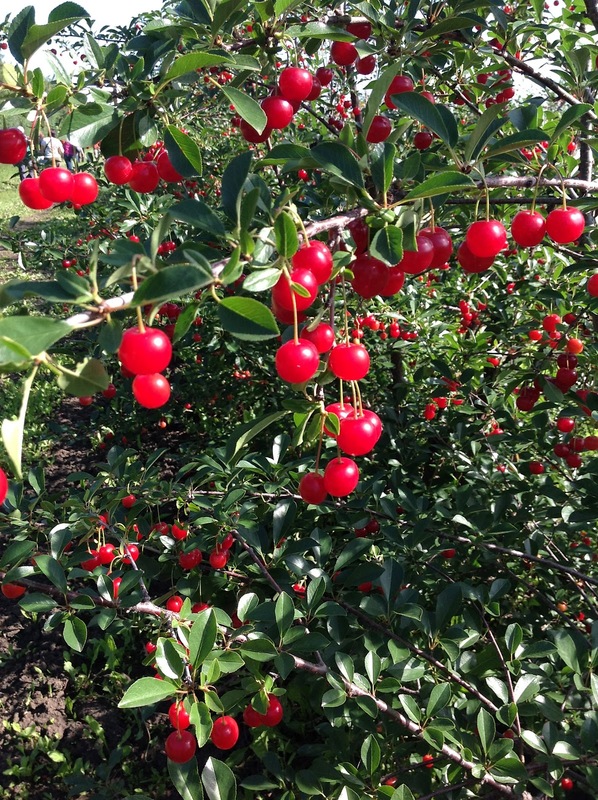 Pick Prairie Hardy Fruits... or plant them now.